Running the ASP.NET Core Webhooks project locally and debugging the AzureAlertWebHook end point. Full Series links can be found here. In the previous post I wrote about how to get and build the ASP.NET Core Webhooks repository. In this post I'm going to investigate how to test one of the webhooks locally. For this I am going to start with investigating the AzureAlertWebHook. Why choose this one? It is relatively straight forward and should require minimal setup. This means that we've have not setup out security secrets correctly for this webhook to function. To setup your secrets you need to right click on the web projects and select "Manager User Secrets". You should never add secrets for application configuration files which are commited to source control. The value of the adamalert property is the known secret which you will use to setup your webhook in Azure. It will be passed in through the url. Once the user secrets are set then run the web application again in debug mode and you should be presented with an empty browser window. Now it's up and running you can test it. To test it locally I use a rest client called Postman which allows for submitting various http commands to an api endpoint without the need to create a temporary code client. 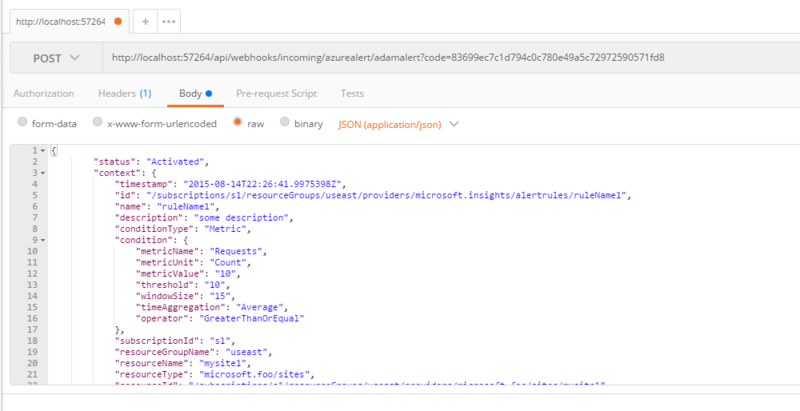 The body of the request is made from RequestBody property of the expected JSON payload from the Azure alert. More details can be found here. You should now be able to add a break point into the Controller action AzureAlert and be able to see what the values are of the model values being passed into the Controller action when submitted through the rest client. 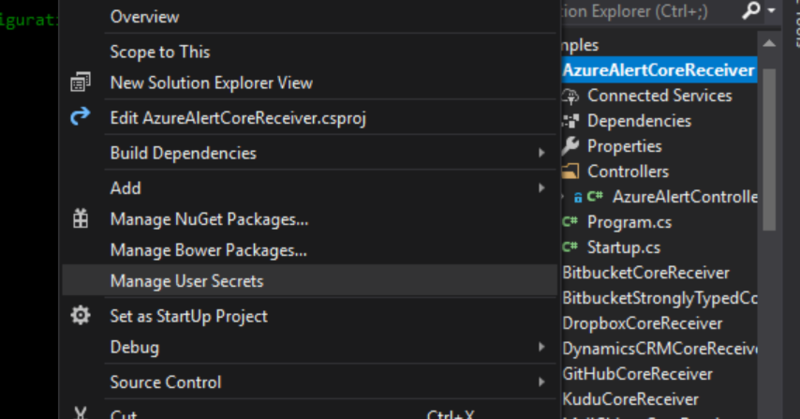 In this blog post I have showed how to get the sample AzureAlertWebHook project running locally, setup the security secrets for the webhook to allow for the code to be executed and debugged locally using a rest client.